PICTURE PERFECT WEDDING by author Fiona Lowe is a Carina Press release for August 2013. Looking for a field of sunflowers to photograph a wedding party in, Erin runs in a snag. The farmer is not keen to offer his sunflower fields. So how will Erin go about convincing the farmer, Luke Anderson, that it is for the best? Luke is not too happy in his very predictable life. The arrival of Erin adds much needed colour to his staid life. But the question is, will Erin stay? What about her goals? PICTURE PERFECT WEDDING has a strong heroine in Erin and a gorgeous hero in Luke. It is a fast paced romantic tale which takes a reader deep into both the characters’ psyche to discover why they are against love and commitment. It is a hilarious journey as the dialogue is humorous and enjoyable. Erin is strong in her convictions but yields to Luke as she is so attracted to him. Author Fiona Lowe does a great job with the secondary characters. I just loved reading Martha and Vern’s retirement issues as well as getting connected to Nicole the wedding planner and her budding romance with the town’s new fire chief. Building business is tough enough just ask any business owner, it takes months of preparation, a lot of determination, hours and hours of hard work and even then there is always the possibility of failure or set backs that could seem minor but could mean the downfall of the business. Therefore it is always crucial to make sure as little as possible goes wrong and push for the best results. In the new Fiona Lowe read we meet Erin she needs to plan a perfect wedding and to make it happen she will need to convince hold-me-down-or-I'll-kiss-you-senseless farmer Luke Anderson! But convincing this man is easier said then done and when these two go at it their dull world of no happy ever afters brightens up faster then when a rainbow hits the sky after a storm! The main characters of both Erin and Luke were spectacularly written by the author , I felt so emotionally connected to Erin as her will to push to succeed shined through, and much like myself she always pushes for the best result to make those around her happy. Luke was a character that broke my heart, I was so sad to see him suffer with a predictable life, as we all know you need to make the best of each day you have on earth and when things start being predictable you need to try to do something to spice it up, or you will for sure be bored and fall into a pattern that might very well drive you over the edge of madness. The author taking these two characters and letting fun and sassy meet boring and predictable made this a truly perfect sparks flying romance filled with loads of heat and drama! The backdrop settings were so creative and perfectly described by the author I actually felt as it I could touch the wedding buzz ! I loved the dialogue, deeply emotional to the point where I thought I might just actually start bawling my eyes out, which is always a good sign that the author knows how to pack a punch. What I totally adored was the humour that the author dashed into the read, I laughed out load so badly that yes those around me gave me one look and most definitely thought me mad! But again this is the joy of a Fiona Lowe read, you not only get sweet and sensual romance, but also tear jerking emotion and down right funny laughter and good times. The moments of conflict were absolutely brilliant, I was torn between wanting Erin to win the battle and at other times I wanted Luke to win , but with both giving as good as they get it just pulled this read together on that " Ah perfect romance and heat " level that I very dearly love. 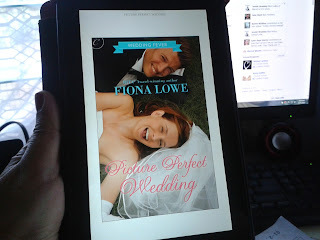 I highly recommend this read for all fans of Fiona Lowe reads, and for those romance fans looking for a guaranteed set the mood read that will have you wanting a picture perfect wedding of your very own! "Sunflowers and ice cream is only the start of this perfect romance"
Copyright Nas Dean. Helen Sibritt & Tash N. Ethereal theme. Theme images by loops7. Powered by Blogger.